Everything you need to cultivate a once-believed-extinct bonsai forest. The Dawn Redwood tree was known only as a fossil until the first living specimen was discovered in a Chinese rice paddy in 1946. It was carefully cultivated, and now you can create your own forest of Dawn Redwood Bonsai Trees with this unique all-in-one growing kit. In addition to tree and moss seeds, the Bonsai Kit includes three seedling pots, growing medium, and a pair of bonsai scissors. 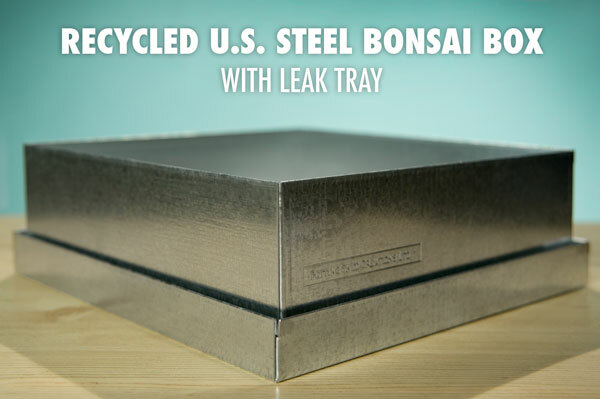 With reuse in mind, the kit's recycled steel packaging also serves as its bonsai tray. Handmade in the USA. Please note that this kit cannot be shipped outside the US. Dimensions (of boxed kit): 8.5" x 8.5" x 3"
Grow your own forest of bonsai trees! The Dawn Redwood Bonsai Tree Kit includes everything you'll need to grow your own bonsai forest. And what's not awesome about growing your own miniature forest of a species of tree once thought to be extinct? Nothing, that's what! 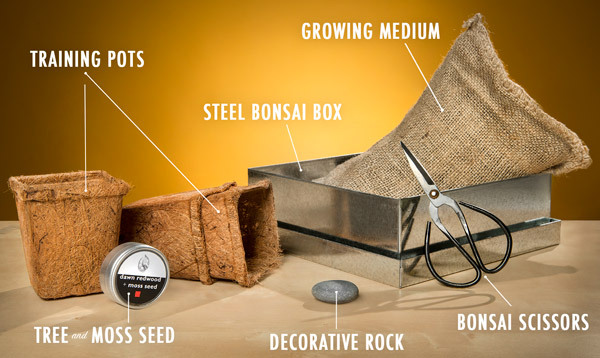 Here's what you'll receive in the kit: tree and moss seed, seedling training pots, growing medium, bonsai scissors, a steel bonsai box, decorative rock, and detailed instructions. 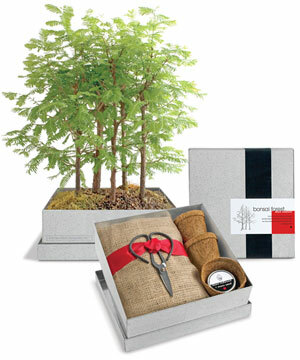 The Bonsai Growing Kit includes everything necessary to grow your own Dawn Redwood bonsai forest. Believed to be extinct, a living specimen of the Dawn Redwood was discovered by a Chinese forester in the 1940s. These ancient trees, related to the coastal redwoods of California, were selected for this bonsai growing kit because of their beauty and fast growth rate. Additionally, they are one of a handful of deciduous conifer species. This means that the Dawn Redwood's foliage changes color in the autumn and eventually falls off. However, its pointy leaves more resemble those of traditional "evergreens". 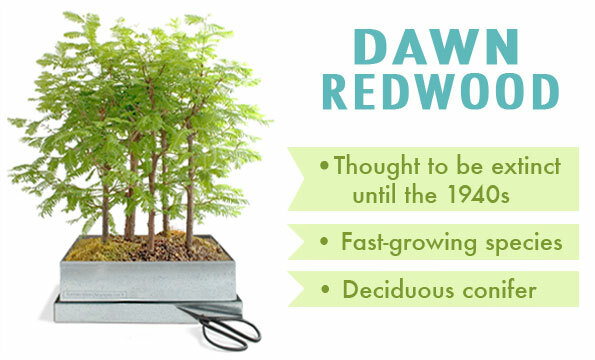 The Dawn Redwood was chosen for the bonsai kit because it is fast-growing and is a rare deciduous conifer. Seriously, everything you need to start your own bonsai forest is included in the kit. Well, except for water, sunshine, time, and a little tender lovin' care. But, you've already got that stuff. 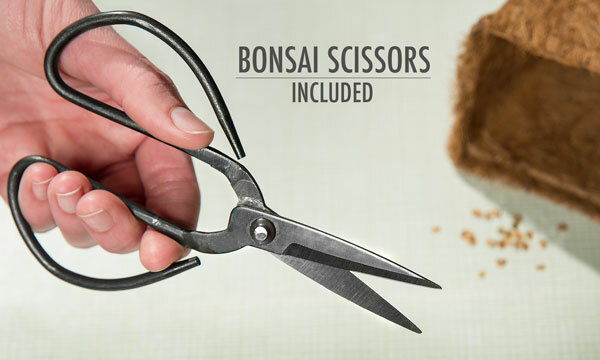 What you probably don't have lying around the house are the tools of the bonsai trade: namely a high-quality pair of bonsai scissors which are included in this bonsai growing kit. A pair of bonsai scissors are included in the kit. Simply remove the top of the gift box and flip it underneath to serve as a drainage trap for your bonsai trees. The box is made from US recycled steel. bonsai box for growing your Dawn Redwood forest. Question: How long will it take to grow my bonsai trees? Answer: Keep in mind that bonsai is the art of growing trees (not plants) in a small shallow tray which (combined with other factors) keeps the specimen fairly small. So, while you can expect seedlings in about 15-20 days, you will not have a full-blown bonsai "forest" for a few years. Question: I don't have a green thumb. Will I be able to do this? Answer: Yes. While there are masters of bonsai who have perfected their craft for generations, the process is rather simple. Bonsai is simply the art of growing a plant in a shallow tray. Follow the included instructions and you'll be fine! Question: Blah blah Mr. Miyagi blah blah blah? Answer: Yes, Mr. Miyagi from Karate Kid was keenly interested in the art of bonsai. We do not know if Mr. Miyagi ever grew a Dawn Redwood bonsai tree as he is a fictional character. Question: How can I best ensure successful germination of my seeds? Answer: There are three factors to keep in mind. One, don't plant the seed too deep! The seed should be lightly covered with about 1/8" of soil. Two, don't overwater or underwater your seeds. The soil should be damp like a sponge, but do not let the soil dry out between waterings. But if the soil is too soggy, the seed will become moldy and not germinate. Lastly, temperature is important for seed germination. Soil typically is 5ºF/-15ºC cooler than the surrounding air. Optimum soil temperature for seed germination is around 70ºF/21ºC. If your room temperature is cooler than 75ºF/24ºC, you will need to supplement heat with a simple desk lamp about 8" from the top of the pot. If your room temperature is warm enough, place pots and seedlings in a location with morning sunlight.